Manno’s origin is shrouded in mystery. From his facial characteristics it seems clear that he is a central chimpanzee (Pan troglodytes troglodytes), which ranges in Angola (Cabinda), Cameroon, Central African Republic (CAR), Republic of Congo, Democratic Republic of Congo (DRC), Equatorial Guinea and Gabon. Fewer than 100,000 central chimpanzees remain the wild and IUCN classifies them as Endangered on the Red List, indicating that they have a high risk of extinction in the wild in the near future. They are also listed on Appendix I of CITES, which means that their commercial trade is prohibited. 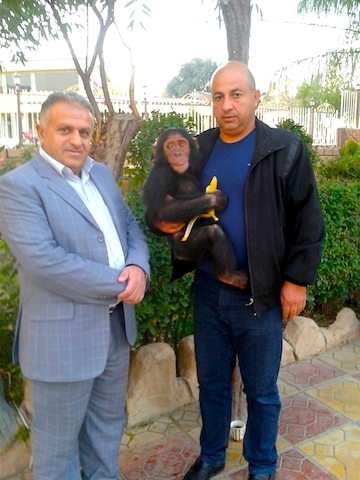 Ramadan Hassan, the Duhok Zoo owner, said that Manno and another chimpanzee were purchased from a farm in Syria that was used as a holding area for wild animals smuggled in from Africa and sold to buyers throughout the Middle East. But Ramadan said many things that turned out to be false or contradictory. 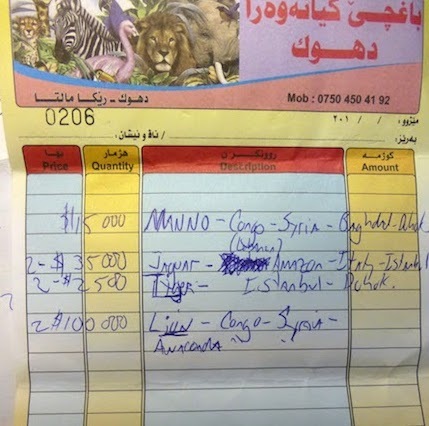 Ramadan said that he bought Manno from Erbil Zoo, and Dr. Sulaiman said that Ramadan brought two chimpanzees from Syria and sold Manno’s brother to the Erbil Zoo. Who knows? 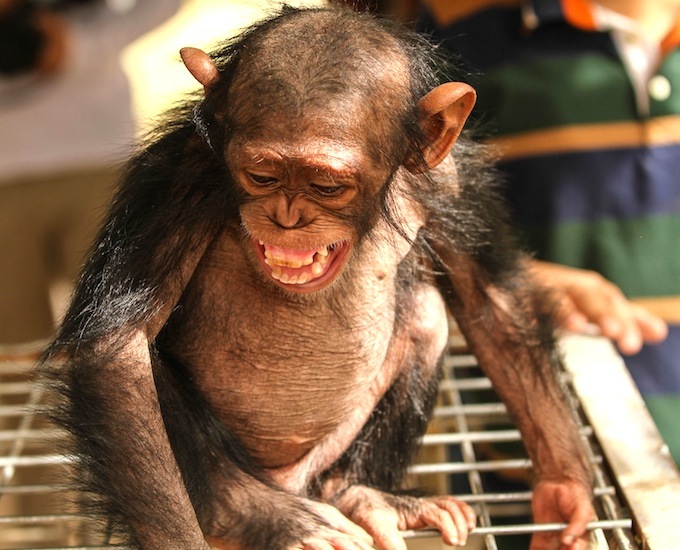 It is equally possible that Manno originated in a zoo in Damascus that Jason Mier visited in 2009, which was advertising chimpanzees for sale. The zoo sold chimpanzees smuggled in from Africa on a regular basis. A third possibility is that Manno was born in one of the two known breeding facilities in Egypt that illegally import and export great apes, and in which chimpanzee births have occurred. It is possible to drive from the Safaga Breeding Farm in Sharm el Sheikh to either Nuweiba or Taba and take a ferry to Aqaba, Jordan, then on by road to Amman and Damascus. 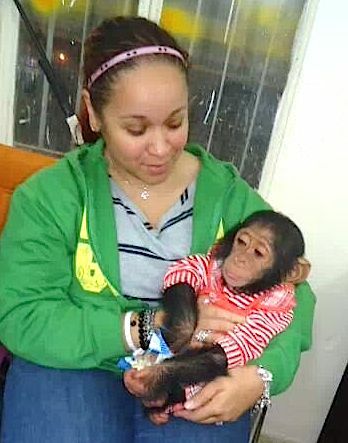 PEGAS was told first-hand by one of the Egyptian traffickers that infant chimpanzees were simply put in suitcases and driven from Sharm to foreign destinations. We know that Manno was taken by car from the Damascus area to the border with Iraq, where he was picked up by a driver from Erbil (we even have his mobile phone number) and taken there with another chimpanzee. The second chimpanzee, which was emotionally disturbed, has disappeared. The Erbil Zoo owner sold Manno to Ramadan Hassan, probably in late July 2013, as Ramadan had mobile phone photos of the chimpanzees taken then. 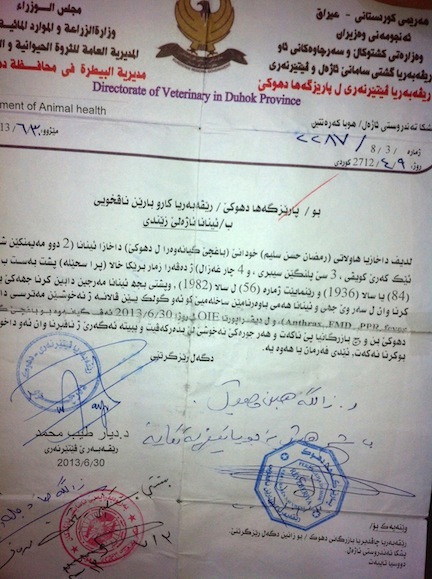 A veterinary health import certificate for the two chimpanzees is dated 30 June 2013. Iraq did not belong to CITES until 2014, but Syria, a CITES Party, would still have been required to issue a CITES export permit and report it to the CITES Trade Database, which was not done. The trade was therefore illegal. Mr. Ramadan told Jason Mier that he knew of other chimpanzees that had gone to a Baghdad zoo and to wealthy buyers in Iran. A female chimpanzee that Ramadan wished to buy cost USD 30,000. Jason Mier began receiving email reports in early October of two chimpanzees that had arrived in Iraqi Kurdistan, one at Erbil Zoo and one at Duhok Zoo. He rang the Erbil Zoo owner, Mr. Khalil Sabir Kawani, who said that he had bought them in Syria and sold one to Duhok Zoo. Jason then began in December 2013 an extended email and mobile phone exchange with various Kurdistan Regional Government (KRG) officials that dragged on for three months. During this time it was established by the KRG that the chimpanzees had been illegally imported. While this was going on, a Canadian high school teacher named Spencer Sekyer volunteered to help out at the Kurdistan Organization for Animal Rights Protection (KOARP), based in Duhok. Although he had come to help out at their shelter for street dogs and cats, he made several visits to the Duhok Zoo, where he encountered Manno and established quite a friendship. 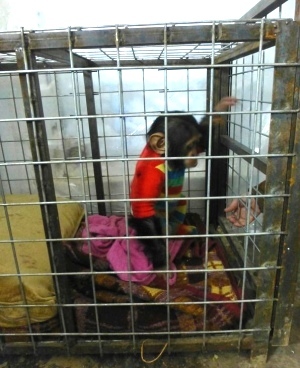 Spencer was there only from 23 December 2013 to 4 January 2014, but he vowed to try and free Manno, as he could see that Manno’s future would be nothing but a solitary cage. Spencer got to know the generous and energetic head of KOARP, Dr. Sulaiman Tameer, and the Duhok Zoo owner, Ramadan Hassan, during his stay. Spencer conducted a brief price survey of how much Ramadan paid for his exotic animals and established that Manno had cost USD 15,000. After returning to Canada in January 2014 Spencer began contacting all the organizations he could think of who might be able to help free Manno, without success for almost two years. Spencer’s notes on wild animal prices and trade routes. Back to Jason – It was eventually established that Manno fell under the KRG Ministry of Agriculture and Water Resources. The Minister agreed to meet with Jason on 19 March 2014, and Jason flew from Beirut to Erbil for the meeting with the aim of getting a seizure and agreement for relocation to a sanctuary. The Minister claimed during the meeting that he was unaware that private zoos such as the one in Duhok even existed, which demonstrates the need to publicize the existence of these facilities. There was a petition against such zoos, and a Facebook page publicizes animal welfare issues in Kurdistan, but evidently more needs to be done to sensitize the government to the issue. The meeting went well and the minister agreed that the chimpanzee import had been illegal and that the ministry would cooperate in seizing Manno and turning him over to Jason for relocation to a sanctuary. After the meeting, however, lower level officials instructed to implement the minister’s orders used a series of excuses and delaying tactics that resulted in Jason returning to Beirut without Manno. Intensification of conflict in the region made further communications with the KRG on the subject of a chimpanzee rescue untenable, so Jason reluctantly halted his efforts. 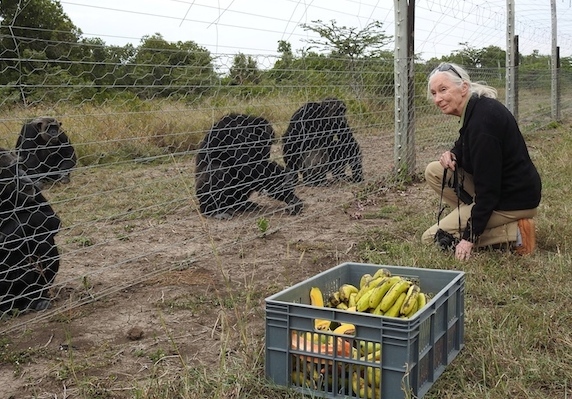 Matters remained in limbo until September 2015, when Spencer attended a talk in Edmonton, Canada, given by Dr. Jane Goodall, the renowned chimpanzee researcher and conservationist. After the talk, Spencer met with Jane and poured out his story of Manno. Jane Goodall decided to try and help, and her efforts started the ball rolling again. *This account is based on information provided by Jason Mier, head of Animals Lebanon, Dr. Sulaiman Tameer, head of KOARP, Spencer Sekyer, and from information that PEGAS has gathered from personal involvement and investigations. This entry was posted in chimpanzee, confiscation, live rescues, Middle East, PEGAS, sanctuaries and tagged ape rescue, Kurdistan, Manno. Bookmark the permalink.